The Overflowing Cup: Watch out! Yesterday, Sam and Caleb collided on their bikes. Caleb's bike, as you can see, is no longer in working order. He was pretty upset, but he's also pretty big for this bike - we were planning on getting him a bigger one this summer anyway. To discipline Sam to watch where he's going when he rides, I had him pick up the pieces that broke off and haul the bike into the garage. 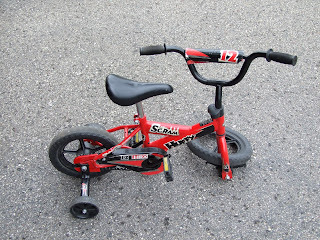 We actually do have a duplicate of the bike for Caleb to ride while he waits for a new one, but this one has a little horn on it, and he's so big that whenever he pedals, his knee comes up and beeps the horn. Makes for a noisy ride. I still have a scar on my chin from falling off my bike when I was a child. I dread (or should I say: dredd? As in Judge ... ) the day one of my children comes running home screaming with blood all over the place.